Rudder Repair and Upgrade — O'Day Mariner #1922 "Orion"
The original 1970 rudder which came with the boat needed a little bit of help. Yes, it was still functional, but the aluminum cheek plates were badly pitted, and a small sheave at the very top (through which the rudder blade downhaul line ran) was stuck, and it made it very hard to pull the blade down. Okay, so I needed to replace it, and the way to do that was to remove the rudder cheeks from the mahogany wood. All the screws holding the cheek plates on were rusted, and it was a lot of work trying to get them out. I ended up having to pry a number of them right out of the wood, which certainly didn't do the wood any favors, but there was some rot there regardless. I also found the stainless bolts attaching the lower pintle to the aluminum cheek plates were seized, and I had to grind them off in order to remove that lower pintle. Once that was done and the cheek plates were free, I turned my attention to the wood. It was really in rough shape. 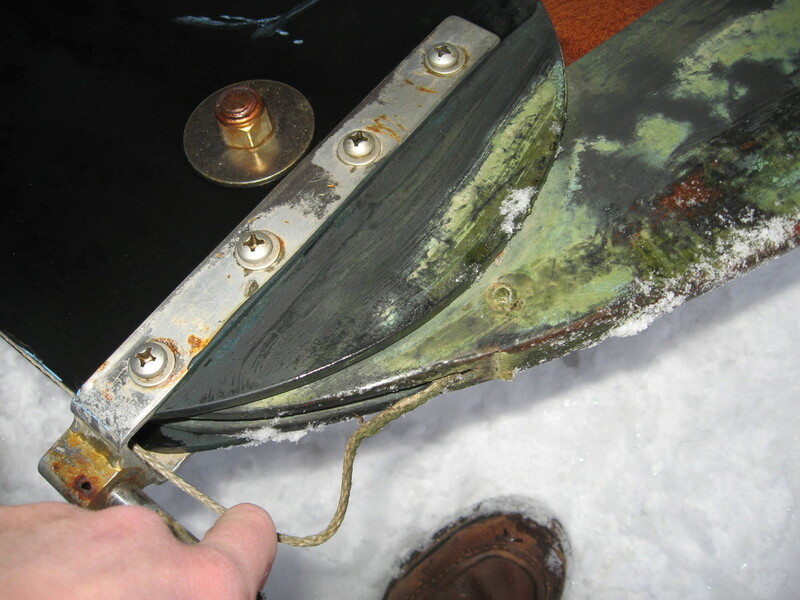 The middle section of the rudder head was fairly rotten, and the rudder blade itself had gouges from contacts with a previous owner's outboard propeller. However, it was certainly salvageable, and I decided that while I could also salvage the upper and lower pintles, I needed to create a new inner wood section, and I would make new cheek plates at the same time out of carbon fiber G-10. Everything was fairly straight-forward since I had templates off of which I could make all my marks. No guess-work here! Just trace and cut. I made the inner mahogany piece from two new pieces of mahogany joined together. I traced the outline and cut it on a bandsaw. It was a little tricky creating the space for the new sheaves, the upper pintle and the slot down the side for the downhaul line, but I eventually got it. The G-10 plates I was able to get from Forte Carbon, a carbon fiber plant nearby in Ledyard, Connecticut, which specializes in everything carbon fiber but most especially in carbon fiber masts for sailboats. In the interest of full disclosure, I will say that it certainly helps that my father works there! Again - trace and cut. Instead of joining the plates with screws like the aluminum plates had been joined, I simply epoxied the carbon fiber plates onto the mahogany. Carbon fiber and epoxy make a very, very strong bond, so I was able to do away with the screws altogether. After that, it was only a matter of reattaching the old lower pintle and putting the old rudder blade back on with the downhaul and uphaul lines properly attached. Here are the finished pictures, although they were taken in the winter after a year of use, so please excuse the grime on the lower edge of the rudder blade. At the tail end of 2008, I switched to using an IdaSailor rudder. It has some advantages over the stock rudder, although it is not legal for class races. For interested parties, I offered the following review on the MarinerSailors Yahoo! Group list in April, 2009 and updated it in August, 2016. These are my personal reviews based on 5 stars. Take note that IdaSailor has since changed to RudderCraft. Unquestionably, the longer and narrower design of the IdaSailor rudder blade improves responsiveness. The action is akin to sailing a dinghy - it is very quick to respond, unlike the stock rudder which tends to have a "bigger-boat feel" to it. When beating, there is almost no weather helm, unlike the stock rudder - it is truly remarkable. With any boat, there will come a point when the boat is heeled over enough that the rudder will stall and the boat will round up. The IdaSailor rudder will indeed hold the boat's course longer than the stock rudder, but I have found that the eventual stall/round-up happens quite quickly, forcing one to react by letting out the mainsheet that much quicker if one wants to maintain course. The stock rudder, although it stalls earlier than the IdaSailor rudder, seems to "let you know" it is going to stall with more advance notice so one can prepare for it sooner. If you thought sailing with the stock rudder blade raised was difficult, sailing with the IdaSailor's longer blade raised horizontally is a test of strength, especially on a beat. 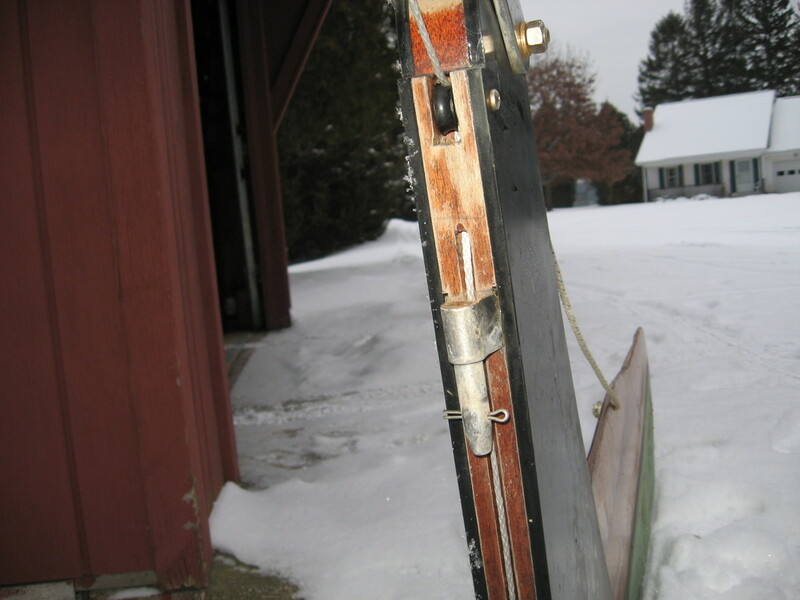 IdaSailor's blade may actually warp or even fail if it's under enough pressure while raised horizontally; IdaSailor rudders are meant to be sailed fully down as much as possible. Stock rudders are slightly beefier and and take the stress of having the blade kicked up. That being said, stock rudders are equipped with either a single uphaul line with a wrapped bungee cord automatically keeping the board down, or there are separate uphaul/downhaul lines. The downside to using a downhaul line is in the event you hit an underwater object; that happened to me early last year, and since the downhaul line prevented the blade from "recoiling", the leading lower edge of the blade was damaged and the downhaul line snapped. The IdaSailor rudder, equipped with a piston, keeps the blade down but allows it to retract should you hit something. The piston then automatically pushes the blade back down when you are free of the obstruction. This is a great feature; however, if you are sailing in shallow water where the blade needs to be kicked up enough to have control, the stock rudder has the edge. Again, depending on the downhaul/uphaul setup of your rudder blade, it may vary, but I have found the stock rudder to be quite easy to operate. In order to raise the IdaSailor rudder to the fully retracted position (the blade totally out of the water), I have to tug on the line just right, but it's something I've become accustomed to, and it works very well. This is somewhat depending on how you use your boat. "Orion" is kept on a mooring with the rudder blade raised, and the lower edge painted with anti-fouling paint. 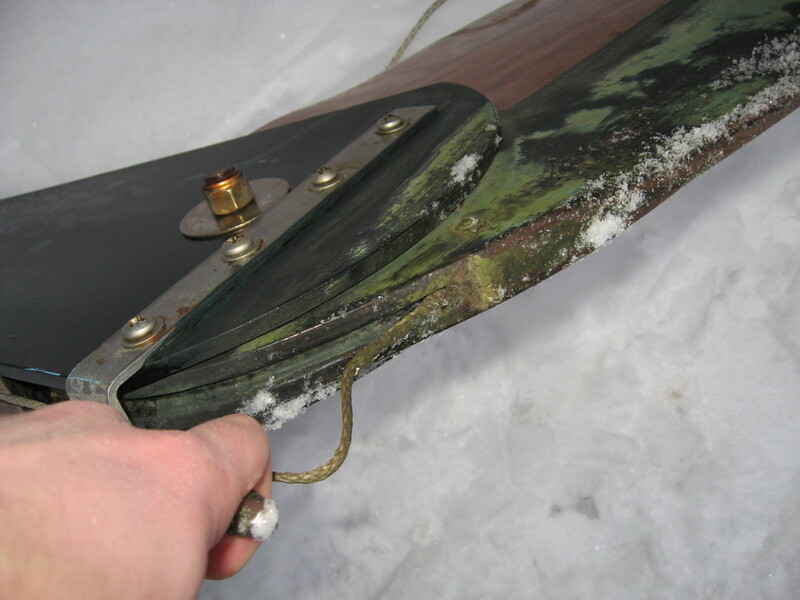 The paint and varnish on the rudder blade need maintenance every year, and the aluminum rudder cheeks are slightly corroded, especially around the bolts. The IdaSailor blade, made out of white high-density polyethylene, is able to retract completely out of the water, negating the need for bottom paint. The stainless-steel cheeks and piston are virtually maintenance-free, save for a fresh-water wash every once in a blue moon. Also, even though I hit the IdaSailor rudder pretty firmly on a rock last fall, the damage was only a slight scratch I was able to sand away in a few seconds. 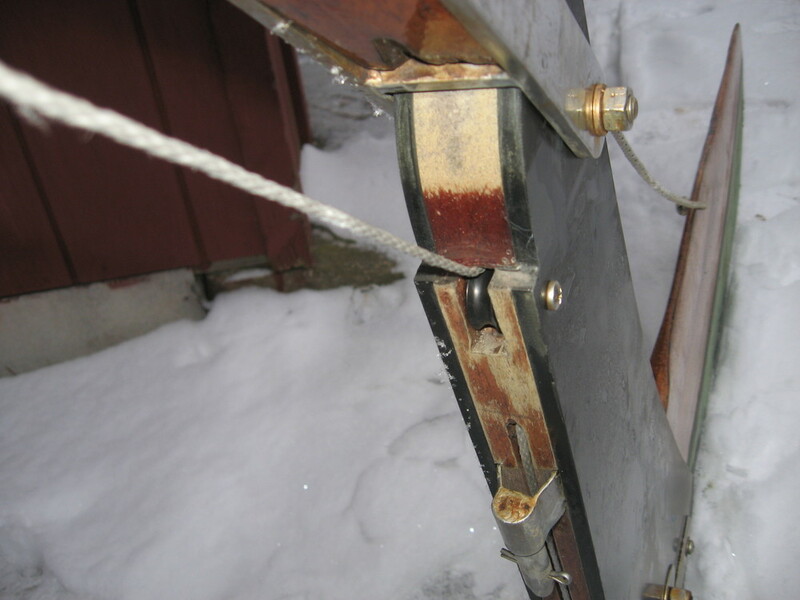 A similar hit on the stock rudder would have severely damaged the wood. A brand-new stock rudder with a tiller (from DR Marine, August 2016) is $798.00, compared to a brand-new RudderCraft rudder with tiller for $599.00. Both options are expensive, but IdaSailor/Ruddercraft clearly has the advantage. I am quite happy with the IdaSailor rudder. Both rudders have their pluses and their minuses, and IdaSailor gets my vote by a relatively small margin. If asked the question, "would I buy it again if my rudder broke", my answer would be, "yes." However, I will say that IdaSailor rudders are not allowed for Mariner Class Association races, including the National Championships and some other fleet races, so I keep my stock rudder in good working condition. As it turns out, I did end up asking the question, "would I buy again if my rudder broke," because it did break! Only a day after Orion was launched for the 2010 season, I went sailing in 10-15 knot winds, seas 2-3 feet, with the rudder only slightly kicked up. I felt a tremendous amount of weather helm, something very strange for this particular rudder. As I made my way aft to check on it, there was a sudden release of pressure and the boat swung head-to-wind. I immediately took the sails down and went back to check on the rudder. It was bent at a strange angle and had fractured where the rudder stock began to get thinner near the rudder head. There was also an unusual curve to the whole blade. I unshipped the rudder, started up the motor and was able to get back home without incident. I called up IdaSailor Marine immediately and explained the situation, also telling them of a few times late last year when I sailed in particularly heavy weather over shallow water with the blade kicked up nearly horizontal. The stress on the helm was unbelievable, and I wondered if that could have contributed to the rudder's eventual failure. As it turns out, this is a style "A" foil which differs from their "B" foil as it is thinner stock, and it is right on the edge of being too thin for a Mariner sailing in the conditions in which I sail on Long Island Sound. New Mariner rudder blades are made with the "B" foil, but I had originally purchased this "A" foil at a significant discount as IdaSailor was looking to get it off their shelves. I had some idea of the risk involved; I guess I didn't think it would actually happen. As it was covered under warranty, I only had to pay for shipping the rudder back to IdaSailor and for shipping to receive a new one. They gave me another style "A" rudder again, as a style "B" was on back-order and wouldn't be available for quite a while, and they wanted me to be able to get back out on the water as soon as possible. They said I should be able to trade in this style "A" at the end of this sailing season and put it toward the purchase of a new style "B" that I could use the following year, which I did. For me, the biggest advantage is simply to have the blade kick up completely out of the water. Overall, I am happy with IdaSailor and will be using their rudder for the foreseeable future.